Bigcommerce is aiming to take the guesswork out of running an online business, as the e-commerce platform has unveiled a new real-time analytics solution. The solution, dubbed Bigcommerce Analytics, provides retailers with marketing, merchandising and transaction data that can be leveraged to make better decisions and grow revenue. Moreover, by leveraging the transaction and catalog data Bigcommerce retailers already have access to, Bigcommerce Analytics offers important information like best-selling products, popular categories, average order value (AOV), purchase funnel analysis, abandoned carts, category-level merchandising and customer acquisition insights. 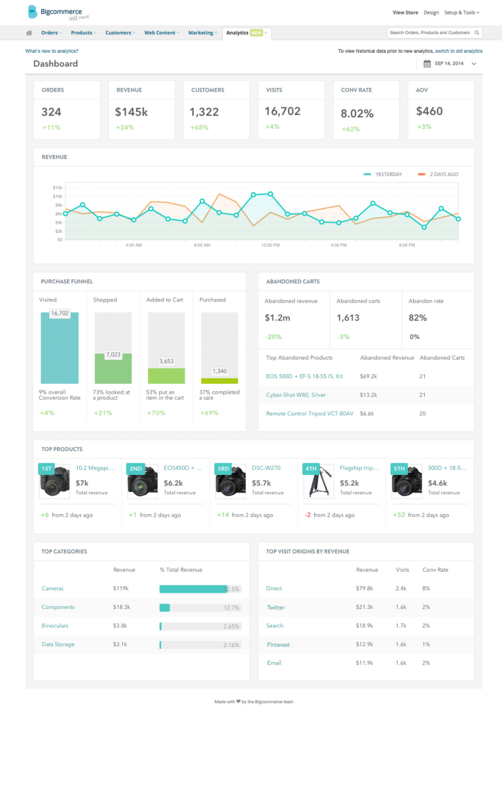 With the Bigcommerce Analytics dashboard, retailers can keep tabs on their most important real-time metrics like orders, conversion and merchandising. Plus, the solution provides retailers with one place to measure both marketing and social media campaigns, enabling them to quickly identify what products are selling based on promotions, email and social channels. The dashboard can also be leveraged to help retailers optimize their inventory based on real-time sales, as well as better analyze the behaviors of both repeat customers and former shoppers, and identify lost revenue opportunities. It is important to note that Bigcommerce Analytics is currently in beta, but general availability is expected in October.